Ahh, I never thought to look in the nether (I don't go there much). Sure we can't get nether-themed dungeons as alternatives to the fortresses? I've been asked about this before, and while I could see adding dungeons to the nether, I couldn't replace the nether fortresses without using reflection (as far as i know). I really try to avoid using reflection if i can. I always thought a good nether dungeon design would be one that has levels on the top and bottom, close to the bedrock, and has a shaft that spans from top to bottom connecting the two parts, with hanging platforms extending out. Even if you don't replace the nether fortresses, adding new nether-specific dungeons would be a nice addition. The way I do things now would make backporting to 1.7.10 relatively trivial. So that could be a thing. same - this is THE favorite mod in my household! I had been holding off until 1.9.2, but I'll just post a 1.9 version in beta status. I'm assuming 1.9 forge is still subject to the AI memory leak issue fixed in 1.9.2. Thanks for posting the beta! Having a blast here with the new combat update and this makes survival quite a bit more challenging. Haven't noticed any issues specifically with the mod but will provide feedback if I see anything glaring. Cheers! The hoppers in the bunker room with the auto furnaces aren't facing the correct direction. Is there a way to use this mod in your current pre-existing world? If there is, I can't find instructions anywhere. My 4 kids have built a lot of things that I don't want to destroy, but would like to give them "adventure" dungeons to go with it. Thanks so much! The kids are having a blast now! This is a very fun mod indeed. The only issue is that I always leave level 1 with enough food from the chests to cure world hunger. After visiting here I can see you have a loot-settings-demo.zip at the bottom, of which contains 7 .json files which can be edited. Is loot-settings-demo.zip for editing the chest in the loot, or the loot that is dropped by mobs? I've had a sneaky peek at your .class files within roguelike-1.7.10-1.4.4.jar and I can't find any references to any food items so far, but the loot calculations look quite complex so I will keep looking for now. Many thanks mate, keep up the fantastic work!! Although I feel like a .class-dolt, that link has opened a whole new door to meta world. Thanks again dude, it is almost too fun to fps Diablo style! How does the spawn frequency config setting work. Does a higher value mean more common or less? Larger numbers mean less. I made a table to kind of demonstrate approximately how it works. I didn't come up with it, it's based on how villager spawning algorithm works, which is why if you set it to 10 they will always spawn near villages. Which I thought was neat. Yup. 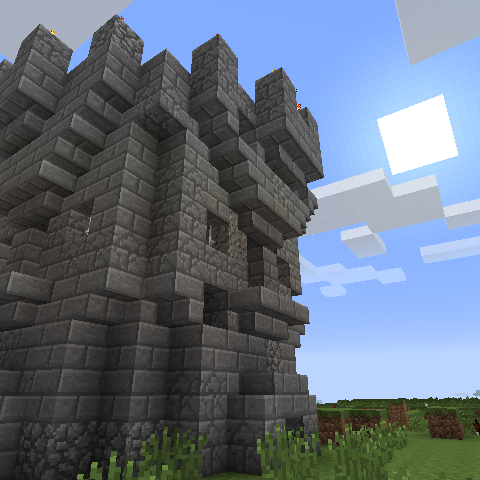 My Stronghold generated as an RLD. I'm doomed. How does the spawn Frequency config setting work. Is it higher means more chance to spawn or lower means more chance to spawn?